mysterious wooden box – All Things AAFS! 03/08/2013 by All Things AAFS! Unusual-ology: Ten Year Old Boy Finds ‘Egyptian Mummy’ In Grandmothers Attic. Alexander Kettler, a ten year old boy from Diepholz in northern Germany, had a startling discovery in his grandmother’s attic when he stumbled upon what appears to be an Egyptian mummy in a mysterious wooden chest. The wooden box, which is covered in ancient hieroglyphs, was apparently bought in Africa around during the 1950’s by his late grandfather. But this Egyptian mummy isn’t all he found in the wooden chest. The chest also contained a death mask and a canopic jar, where the organs removed during the mummification process are stored. Image of the suspected Egyptian mummy in the hieroglyph covered sarcophagus. The boy’s father now plans to take the mysterious box to Berlin to get it examined by experts to see whether this is a genuine mummy or a fake. He believes that the sarcophagus and jar are fake but the mummy might prove to be the real deal as it’s not “something you could buy at a shop around the corner”. If the mummy is sent off for verification it will be subjected to MRI and CT scans, which may come back negative as mummies tend to be so dehydrated that there is a lack of hydrogen atoms – which the scans rely on. The use of carbon dating will be fundamental in identifying whether this is a true Egyptian mummy or a fake. There are lots of problems occurring in the archaeological world, from fake mummies or mummies being wrongly labelled as something there not. One such example is my Unusual-ology post focusing on the topic of a lecture I had during my undergraduate degree. The lecture explored the past of a decapitated head which had preserved soft tissue, that was on display in a Wiccan and witchcraft museum under the guise of an execution victim, which was later stored in a decorated wooden box in a Church. BBC. 2013. German boy finds ‘a mummy’ in grandmother’s attic. BBC News. Available here. Daily Mail. Mummy there’s a mummy in grandma’s attic! 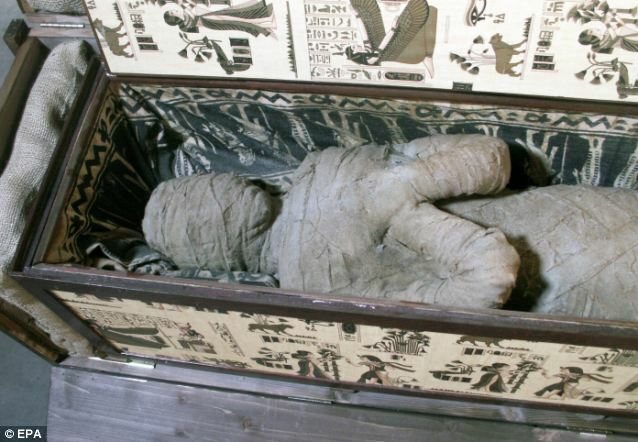 Boy discovers ‘Egyptian body’ inside an old wooden chest. Available here.